TheBlueGuerilla: Labour Official wants to bury Blair with Thatcher. Labour Official wants to bury Blair with Thatcher. 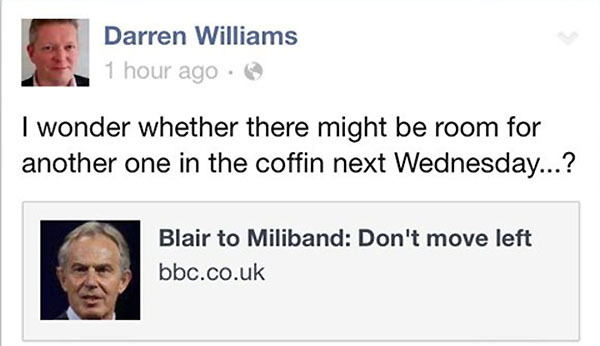 Labour official & member of its National Policy Forum Darren Williams sensationally responded to Tony Blair's criticism of the Labour Party yesterday saying - "I wonder if there might be room for another one in the coffin" on social networking sites Twitter and Facebook. The Labour official has added to the shameless distasteful commentary from those on the Labour Left today. The eruption, in what tbg can only be described as morally void rudeness, by the Labour Left has been ongoing seen since the passing of former Prime Minister Margaret Thatcher this past weekend. A reportedly 'Blairite' Labour source responded to a local reporter saying - "These comments are beyond tasteless. Darren Williams appears to be advocating the death of Tony Blair."